So, here goes. Last summer Kev got really ill and was in hospital for 10 days. 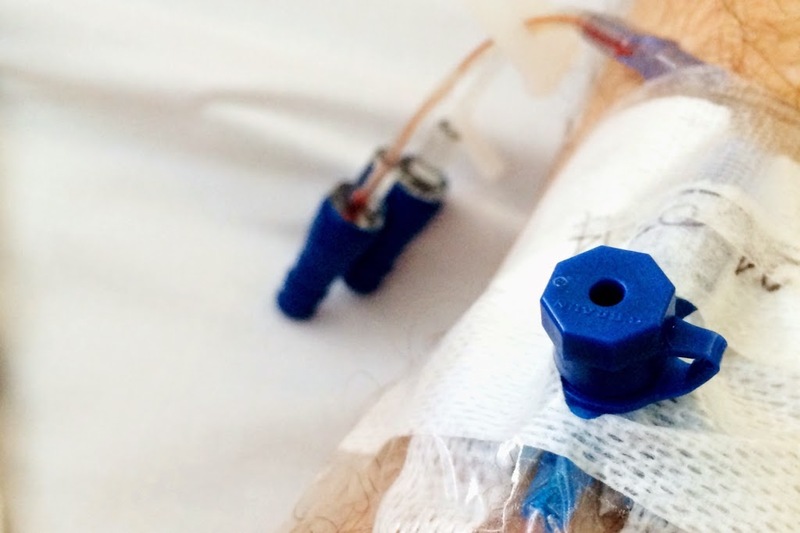 He had a water infection, pneumonia and a systemic virus which travel round his body attacking his major organs. To be honest it was a pretty grim time. It did however get Kev thinking about life and such. Kev had worked in the city for over 20 years to support me and the kids even though it wasn't really what he wanted to be doing anymore. We came to the conclusion that life is too short to be doing something you have hated for so long. An opportunity came along for Kev to work for a local business but this did mean a big pay cut, one which we couldn't really afford. Now, Kev has supported me ever since we fell pregnant with Callum ( we had only been together 9 months and I was just 20). Don't get me wrong, I have always worked part time because I am one of those people who has to do something but now it was time for me to support Kev in his new career path which in turn meant I needed to work more to bump up the missing money. This led me to the heartbreaking decision that I had to leave Sugar and Spice. So, after applying for nearly 40 jobs (no one really wanted me) I managed to get one. As of the 21st February I'll be leaving Sugar and Spice to go and work in a local coffee shop, Caffe and Cream in Billericay High Street. Marion and I made a little film about my move but also Marion's plans for the future. 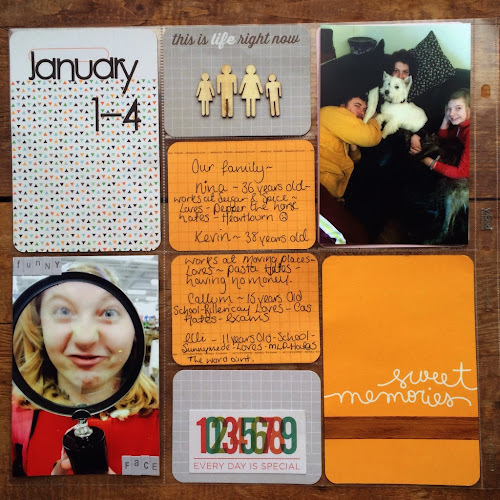 One of my craft goals this year was to document our year, Project Life style. I couldn't wait to make a start. I was worried though, as I mentioned in another blog post, I had dived into the Project Life thing when it first came to the UK but then felt very overwhelmed by the daunting task of the commitment to making a page every week. Now I am ready and raring to go! Before I share any more I must complete the journaling. I think this is an important part of documenting life. A little while ago I was asked by the lovely Emma Godfrey to embark on a secret mission. This mission was to create some samples using her new stamps designed for PaperArtsy . Of course I said yes!!!! 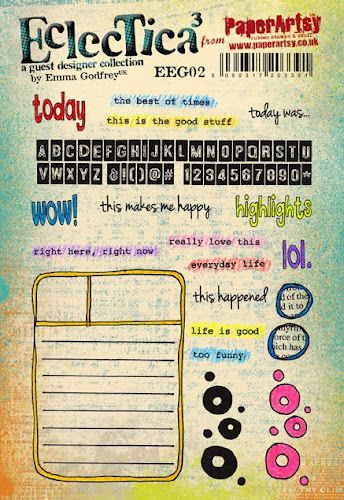 These stamps are designed for your every day documentation. 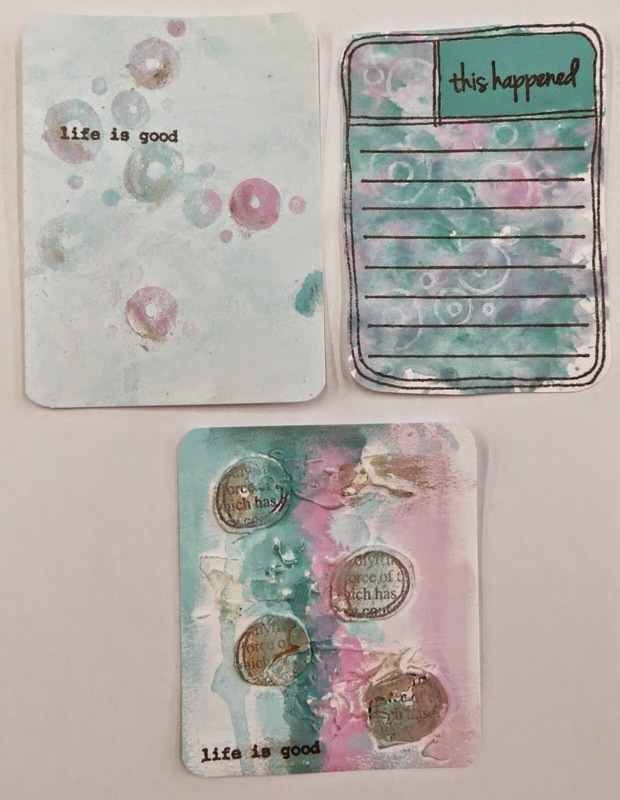 I really loved the journaling card, this would be super for making your own project life cards or for stamping over a pre printed card. 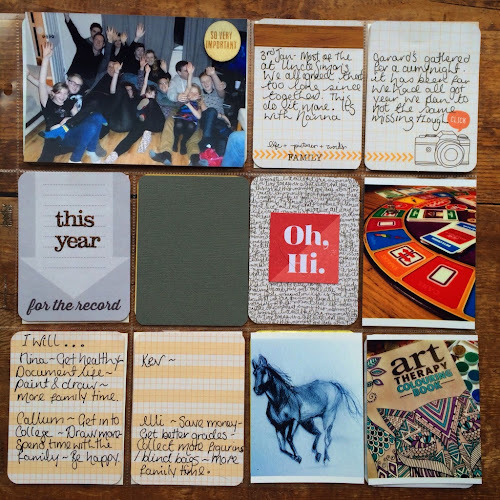 So firstly I made some pocket scrapbooking cards. I wanted to make samples in the style which these stamps were first intended. I am totally in love with the whole watercolour style which is massive right now and wanted to embrace this style. I also had to use a bit of grunge paste! The colour palett which Emma chose for us to work with was just lush! Bora Bora, Mermaid, Old Gold, Orchid, Candy Floss, Sherbet plus white and black as neutrals. 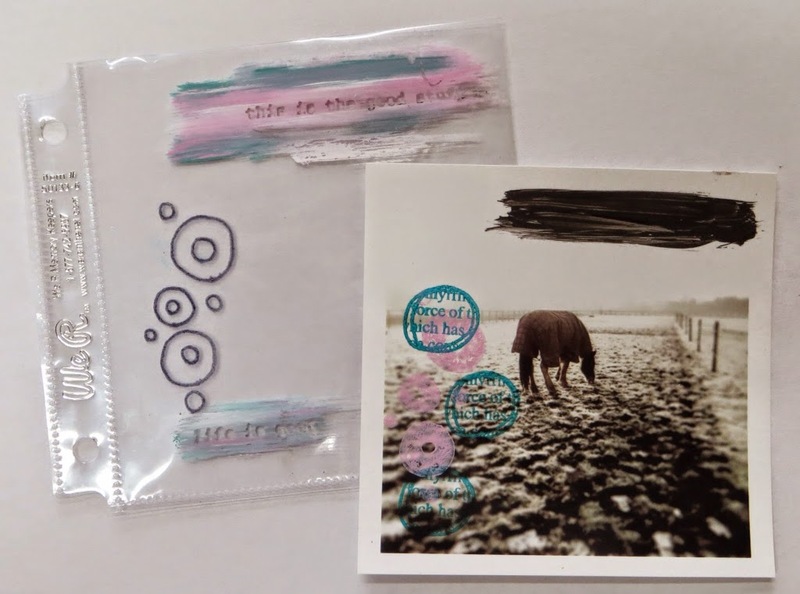 For my other sample I wanted to stamp these yummy stamps directly onto a photo. I couldn't stop thinking about using them in this way!!! So using the Fresco paints and Stazon ink I produced this..
Ah, now here you can see the different layers of this sample. 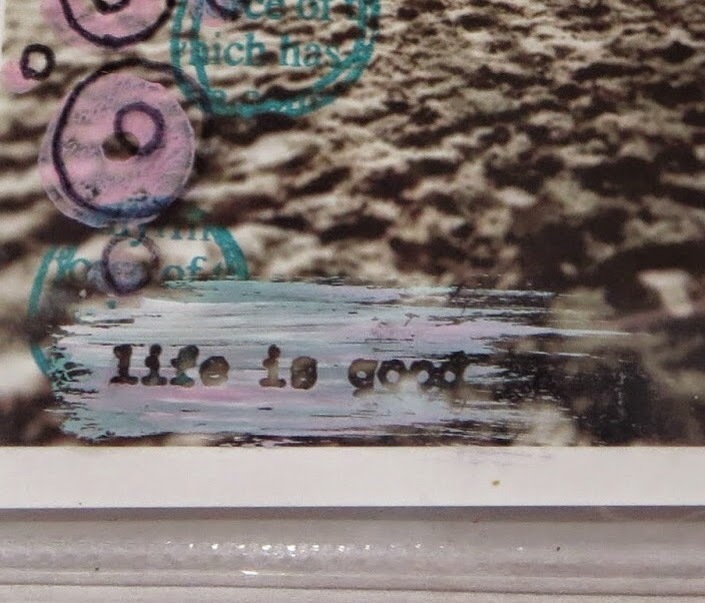 By stamping the text onto the paint on the page protector with Versa Fine, leaving it to dry for a few hours then wiping off the ink with a baby wipe, you get a magical negative effect. I am totally chuffed to have been asked to make samples for Emma. 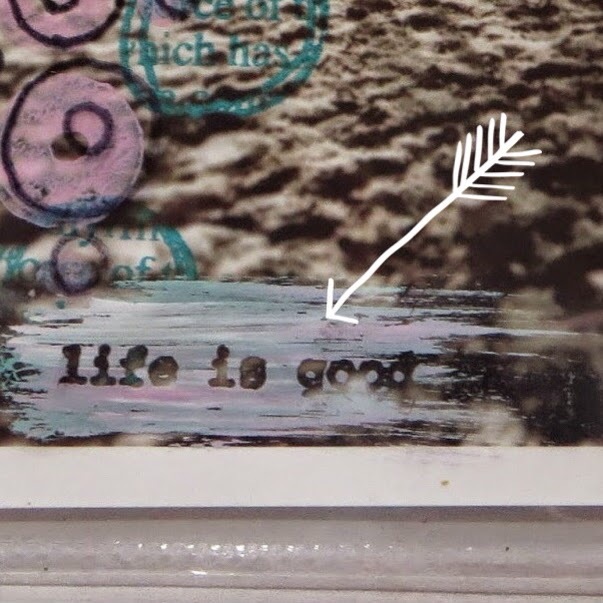 I love PaperArtsy (the products and the guys themselves!) , it was a real honour! That's right. Finally I can officially say I have Hypermobility Syndrome. This is an amazing day for me as I have been fobed off for so long by many medical professionals whom have told me to get on with my pain. Basically for those who don't know what I am talking about, HMS is a connective tissue disorder. This means that the tissue which is there to support the joints is lax like an over stretched elastic band. This can affect any connective tissue in the body including esophagus, heart valves and veins. Because of the silly overstretched veins, blood pools in them making a surge of adrenaline. Ever wondered why I am oftern bouncing of the walls?! Dr Kaz Kaz (coolest name ever!) told me I need to start swimming which is the safest form of exercise I can do. I hate swimming, well not actual swimming but swimming pools. Aaaagggghhh. Dirty, plaster floating, pube flooring swimming pools. The other problem is I can't really swim. I do every stroke possible in one move....... I need to learn. So the plan is, I do specialist Pilates, swim, see a podiatrist, see a Gastroenterologist and do a 8 week pain management course. After posting my new year goals I thought I'd completely copy Leanne And post my craft aims for the year. 2 Take more photos...... I take quite a few every day photos but when it comes to events or gatherings I get a bit shutter shy. I think this connects to my brave goal. 3 Paint and draw...... I used to draw loads. This was before I discovered craft. Callum is so talented with his art, he makes me so proud. It's made me feel really inspired and New Year's Day I decided to give it a go. 4 Finish Stuff....... For many crafters this is probably one of their new year goals too. We like to dip into things then move on, not even completing what we started. This one is an aim that I say every single year! 5 Make more cards..... I really enjoy making cards now and this is largely due to Pinterest giving me a mojo injection but I don't make many for people. I need to be more organised with events and get my finger out and start making. I've started this goal already by making my Mum's birthday card. It was her birthday today. Happy birthday mummy! 6 Sew..... Get my sewing machine out and sew baby, sew! I've already got plans with my friend Karen to kick start this off but to be honest I am a little scared of the mean green machine. I do love a new year, it's like having a good clear out and starting a fresh. 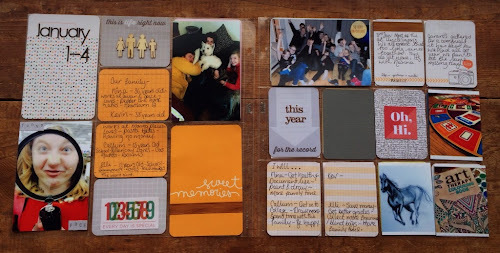 I was inspired by the lovely Leanne to blog some goals for the forthcoming year. This year is going to be a big year for us with Callum going to college and Elli moving up to senior school to name a few. 1 - Get healthy ... I know this time of year everyone says that but I need to. I just can't get below the 12st mark and my body feels like it's going to break in some way or another all the time. I am going to see the EDS specialist in two weeks time and I am sure he will tell me to make some changes. 2 - Make friends and keep them ...... Not in a stalker way but not push people away. Constantly feeling paranoid if I have upset some because they haven't called/ didn't invite me to their charity coffee morning/ didn't invite me out for their birthday drinks is not a great mind place to be. Make an effort and keep in touch. 3 - Be brave .... I suppose this links to the last goal. Make arrangements, say what needs to be said, trust in gods will. Stop hiding!!! 4 - Fill my mind with good ..... Read my bible, read ANYTHING actually, write letters, draw and paint, play board games, walk, craft. 5 - Stick to things....... Clean eating, targets, schedules, dreams. Tell me if you have any goals for 2015.